Jakarta, the capital city of Indonesia. You will mostly go here to transit or just curious what Bangkok sister city looks like. Its quite the same like Bangkok actually. But, still it had different air, ambiet, different "smell" different transport and street.... its had its own personality. When i moved to Jakarta this year i start to realize its a very different place then i used to live at. Hate it or like it i am now in Jakarta. The worse part is i had to deal with the worse nightmare for morning workers, traffic jam. From a city where the driver could actually speed up to 100kmph to this city.. its quite a test for my patience. 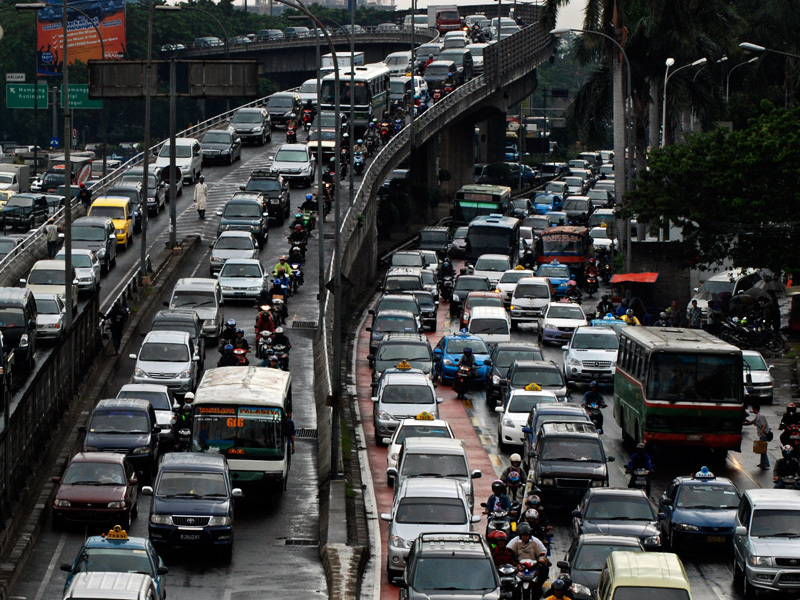 It took me literally 2 hours to cruise Jakarta traffic to get to place where i work. And its getting worse since i use the public transport called "bus". Its horrible! While in Jakarta i tried most of the public transport, name it.. kopaja bus, metromini, the new transjakarta bus, even bajaj-one that looks like tuk tuk in Bangkok. But i never use "ojeg" as i see it-its a good way to commit suicide in Jakarta traffic. Then few days ago i made change, i made peace with another transport mode called "OJEG". When my bus ride caused me 2.5hrs late to work. I jump off the bus and wave my hand to one of the riders. I could only pray, and i ride it, full speed! Its two wheels and its not safe thats what you think and thats what i think... Motorcycle is very common transport in Asia. You could say Vietnam and China also Indonesia, so many people using the motorcycle. They were simply almost every corner of the street. Sometimes if you stood up next to street some of them will offer if you need an ojeg ride. Sometimes they were lined up on the "pangkalan ojeg" or the ojeg terminals. Its not that hard to find them. With this Ojeg ride, i could actually safe my time and MONEY to pay taxi! they could go through a flooded street, rain, heat, and worse traffic jam.. they go to dirt also above the side way! they go to where most cars can't go! even that day i ride AGAINST the way! i just could close my eyes when my knees between two cars side mirrors. 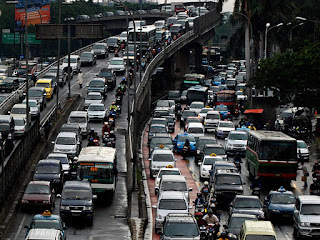 Its hell of crazy ride but i think its worth to try when you need to go from one point to another in Jakarta. I arrive safely 30 minutes before time!! yay! I thought roller coaster ride is crazy enough for my adrenalin but this is something different. I could only say... i will definitely use this AGAIN when i need it.. but not of its not necessarily. The cost is higher than any public transport of course. But its actually also rely on your skill bargaining the price. 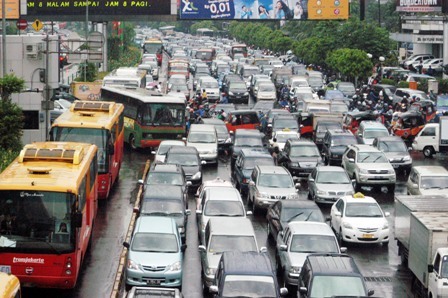 But the common thing is you pay around Rp 5000,- per 1-2kms distance. I would pay Rp 7000,- if that ojeg could get me faster, to the place i need to be! Faster doesn't meant he had to be as fast as Valentino Rossi... hell no.. in Jakarta where the traffic packed, the top speed maybe around 40-60kmph and thats lots better than stuck for 2 hours and not even moving 5 meters from where you are! These days i think most of people who use ojeg service had their ojeg riders phone numbers, so when they need it they will call it like a taxi. And someone actually did pick this up serious and made it as business and build a troop of ojeg raiders called "Go Ojek". I would say this is the first professional ojeg service in Indonesia that cover many services in Jakarta. 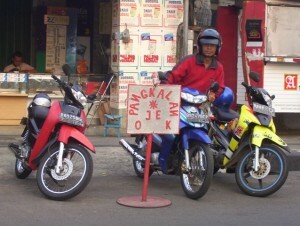 With "Go-Ojek-An Ojek for everyone" you could call for their service. Its quite convenient and as classy as the taxi it self. Its not only deliver you to one point to another but it also provide a courier service. They will deliver mails and even lasagna that you want to order! 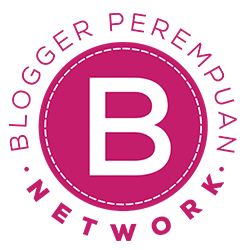 they also doing the corporate service to deliver the employee of a company or even merchandise. Of course there are still traditional ojeg as i mentioned on most of Jakarta street corner, or mall entrance. You will see them and soon recognse then as Ojek Rider. Most of them will smile at you or wave their hands and ask if you want a ride. No worries they're very friendly. Be safe and wear your helmet tight! Indeed... bener2 bisa liat peluang bisnis :) enak juga ada ojek yang terorganisir kek gini kan? hehehe so pasti.. have to enjoy it!